The Star TSP100LAN futurePRNT has been discontinued. No direct replacement is available. It is the latest addition to the TSP100 futurePRINT family. 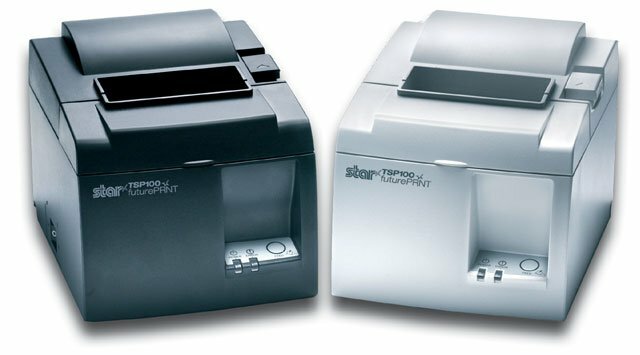 The TSP100LAN futurePRNT printer includes an "Error Reporting Feature" which indicates if there has been a lost network connection by flashing its error lights. The ready button not only tells the user that the printer is on, but also if it has paper and if it is operating correctly. It will also now tell the user if it has a real connection to the host computer.It is provided with a USB connection that provides an immediate "Plug & Play" installation which reduces the time of integration to minutes. The advantages of such a printer are evident for applications such as retail, restaurants, and convenience stores.This direct thermal printer is provided with all standard operating system drivers, Windows, Linux and Mac, and specialty drivers such as OPOS and JPOS. Thermal Receipt Printer, Auto-cutter, Ethernet Interface. Includes Ethernet Cable and Power supply. Color: Dark gray. Also known as TSP143L GRY US. Thermal, Auto-cutter, Ethernet Interface. Includes Ethernet Cable and Power supply. Color: Gray. Thermal Receipt Printer, Tear bar, Ethernet Interface. Includes Ethernet Cable and Power supply. Color: Gray. Thermal Receipt Printer, Tear bar, Ethernet Interface. Includes Ethernet Cable and Power supply. Color: Gray. Also known as TSP113L GRY US. We've been using this printer for over a year, and never had any issues. It's such a great product, built to last! So easy to use with the Square app on the iPad! I have set other businesses up with this receipt printer! Great printer for Square Register! I am using it with a cash drawer and my square register on IPAD and it was so easy to set up and use. Very happy with my purchase. Our company used this device to print coupons on receipts for our clients at their remote locations. These were nicely priced, as we couldn't spend a lot of money giving out printers for free. The ethernet connection is great. We first bought one without an ethernet interface and after a week of debugging, had to give up on it. The installation process is a huge pain though because the drivers that came with it did not work on MAC. Even on Windows I had to hunt down new drivers, but eventually got it working. We printed from an iPad. There was a provided SDK which is always good but it didn't fit our needs. We wrote our own scripts but the SDK helped to reverse engineer it. The carbon paper can get a bit expensive for refills but it comes with one roll (and you can just make your clients maintain the paper!) Overall a great product for our purposes. Thanks!